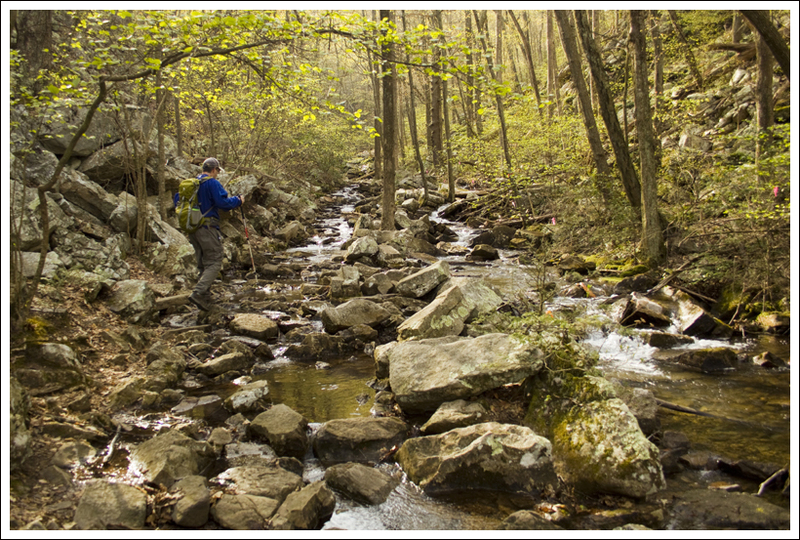 This six-mile loop hike in the Fridley Gap area of George Washington National Forest has everything – views, waterfalls, beautiful stream scenery, rugged climbing and great backcountry camping. 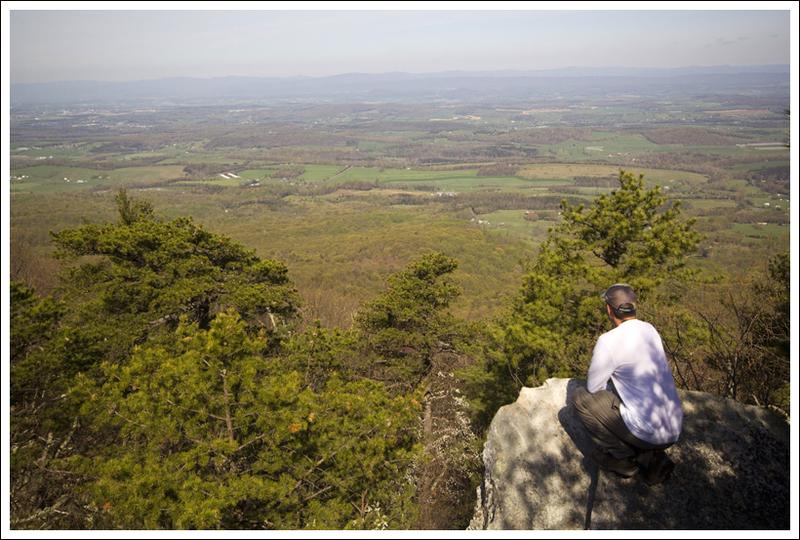 It’s a perfect hike to get away from the crowds in Shenandoah National Park. If you miss spotting the faint side trail behind one of the many backcountry campsites along this loop, you’ll miss the best view of the hike! 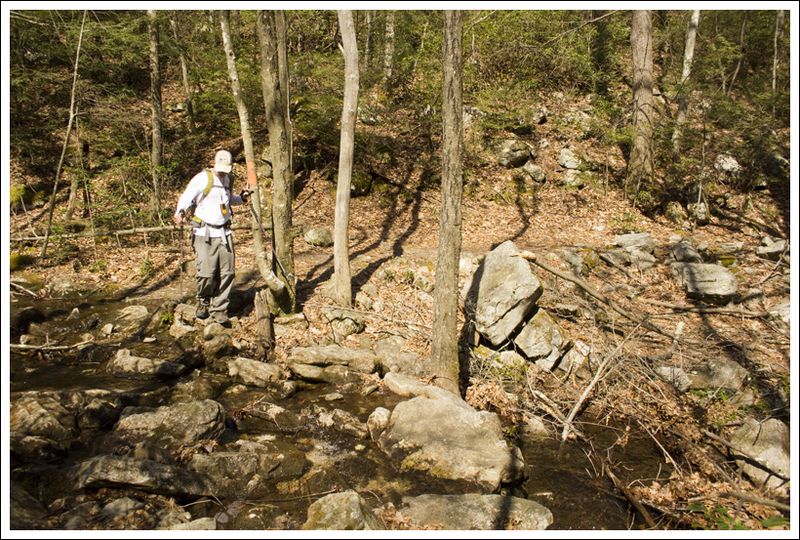 Below: Adam crosses the stream; A small waterfall on the stream; This loop has many choices for backcountry camp sites. 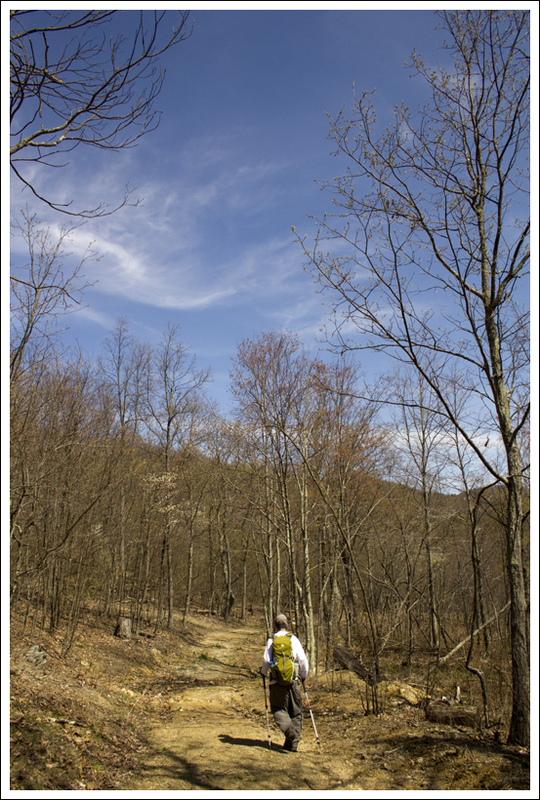 Last year, we made an attempt to do this Fridley Gap loop hike, but we had trouble finding one of the trails. We bushwhacked for a while, but finally gave up. This time when we returned, we had better directions and the blazes had recently been repainted on much of the loop. From the top end of the parking lot, we started on the trail. We saw both purple and blue blazes early on, and started to worry. (Fortunately, it turned out that this was the only section of the trail that hadn’t been recently re-blazed.) Early parts of the trail traverse large rocks, and it’s sometimes tough to see exactly which way the trail goes. We saw faded red Xs painted on the surface of some of the rocks which let us know that we were going the right way. The trail is uphill but not too steep. In .2 miles, you come to a fire road. Take a right here and continue on the fire road. You will pass by some small falls and Mountain Run to the right and a large boulder slide to the left. 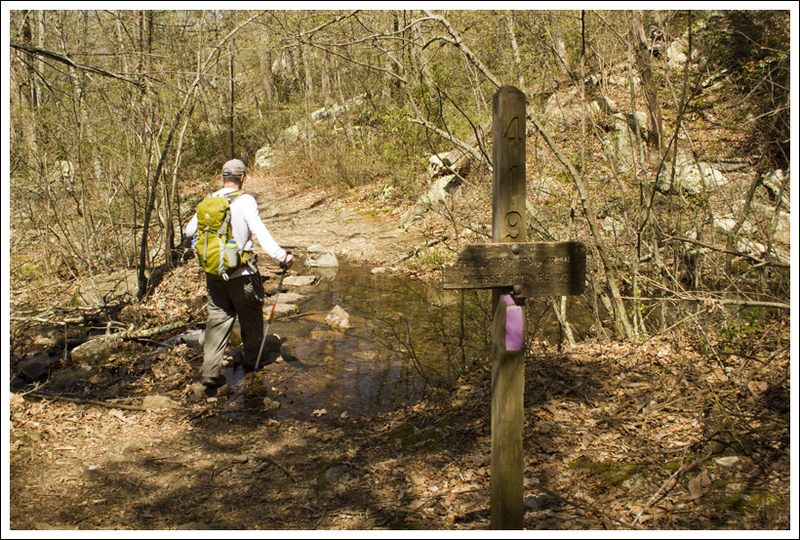 The trail actually follows the streambed, and you will need to rock-hop to continue on. At .45 miles, you will reach another falls area and you will cross over Mountain Run until you see the trail junction cement post. This is also the point that Mountain Run and Fridley Run join. It was at this point that we failed last time trying to find the orange-blazed Massanutten South trail. Looking at the cement post as you approached it, look back around 4:00. You will see the orange blazes on the Massanutten South trail as you will cross the water again (this time it is Fridley Run) and climb up the hillside. These weren’t painted on the trees before (they look fresh now), so you should be able to find your way more easily. Early in the hike, the trail traverses the streambed. There are plenty of rocks, so it’s fairly easy to hop from spot to spot and avoid getting your feet wet. 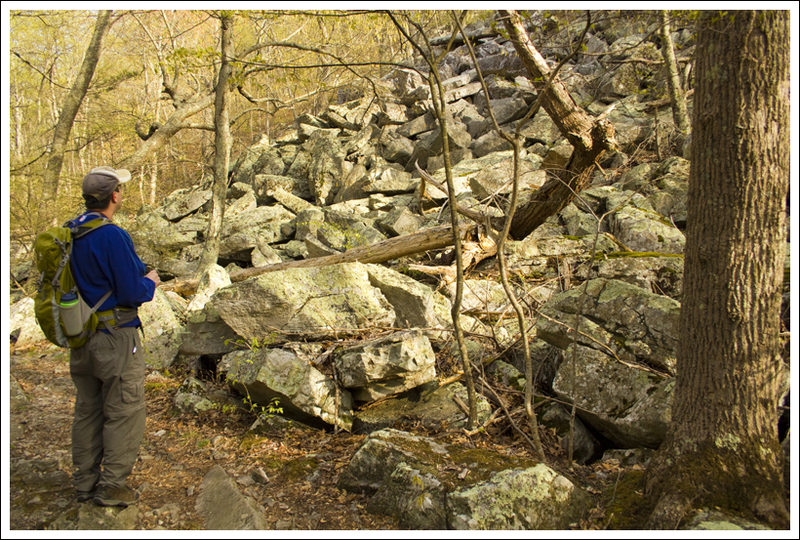 Below: Adam climbs up the trail shortly after the parking lot; A rockslide early on the hike; Blooming redbuds. 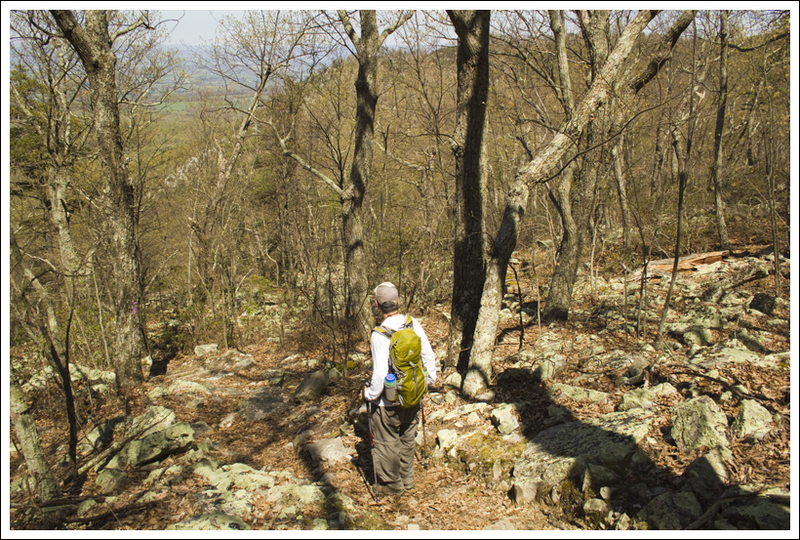 The climb up the Massanutten South trail is quite steep and you may need to stop a few times along the way to catch your breath. This trail is also narrow and you may have to cross over a few blown-down trees, but the trail wasn’t too hard to navigate with the recent re-blazing. At 1.85 miles, you will reach a campsite area. 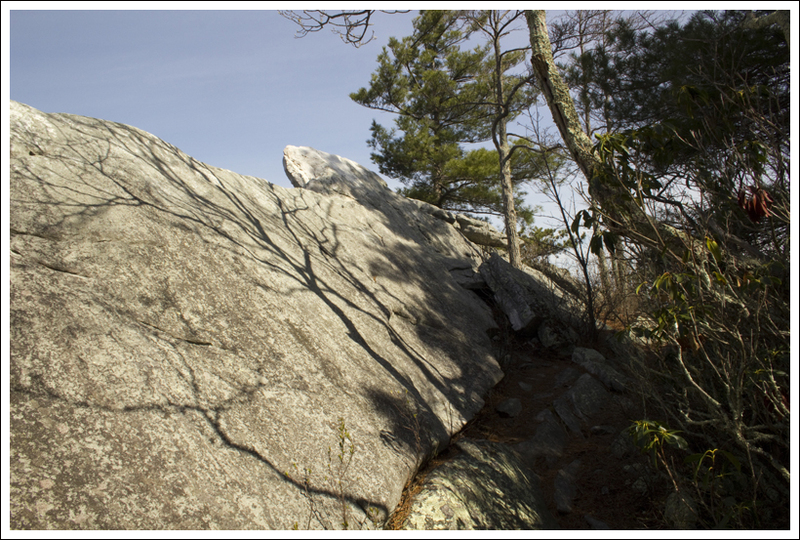 Look closely and you will see a path that leads to a rock outcropping called Grubbs Knob Overlook. Take this path up to the overlook to get the best views along the hike. 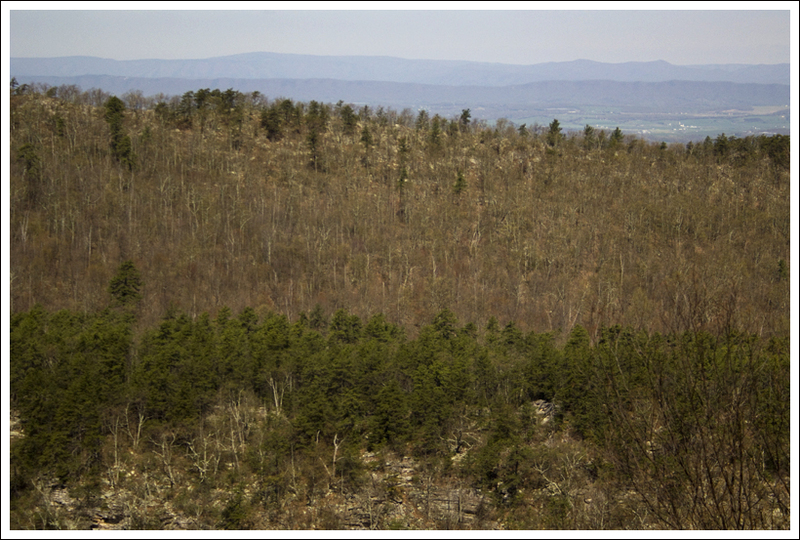 You will see the top of Grubbs Knob to the left from the overlook and views to the west. 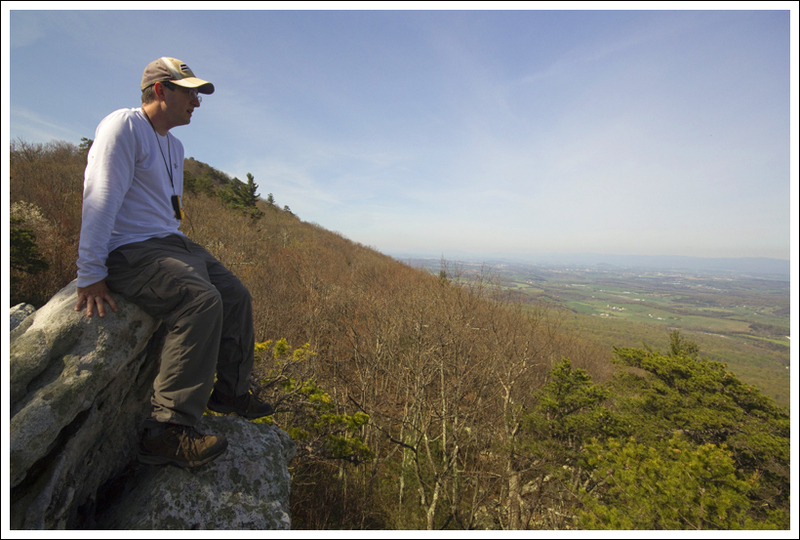 After taking in the view, go back to the campsite and continue along the Massanutten South trail. At 2.05 miles, the trail reaches its peak and then you will start to descend, as the trail takes a steep turn to the left. You will make your way back down this very narrow path and cross Fridley Run at 2.70 miles. 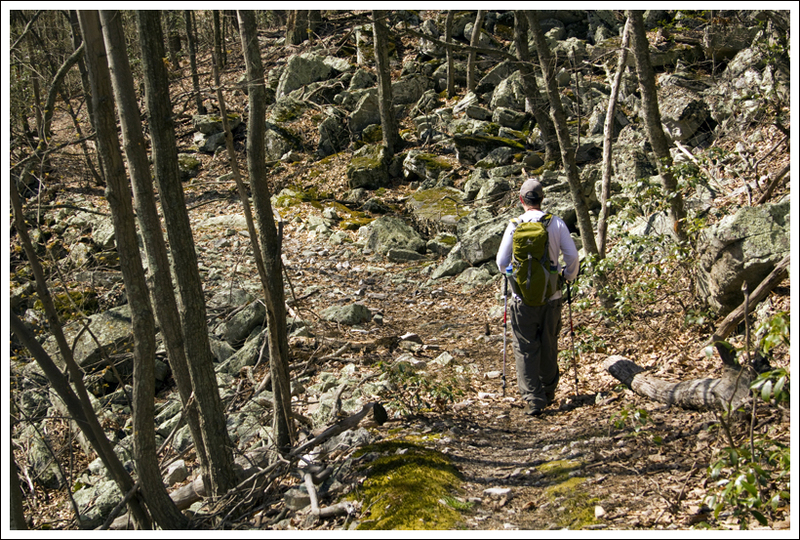 After crossing Fridley Run, you will begin to ascend on the trail again (turning again into a wider fire road) until you reach a rocky slide that gives you views of Fridley Gap and North Mountain at 3.25 miles. Continue to ascend as you walk around part of Third Mountain. The fire road stops ascending at 3.5 miles. The trail then descends and you reach another cement junction post at 3.84 miles. 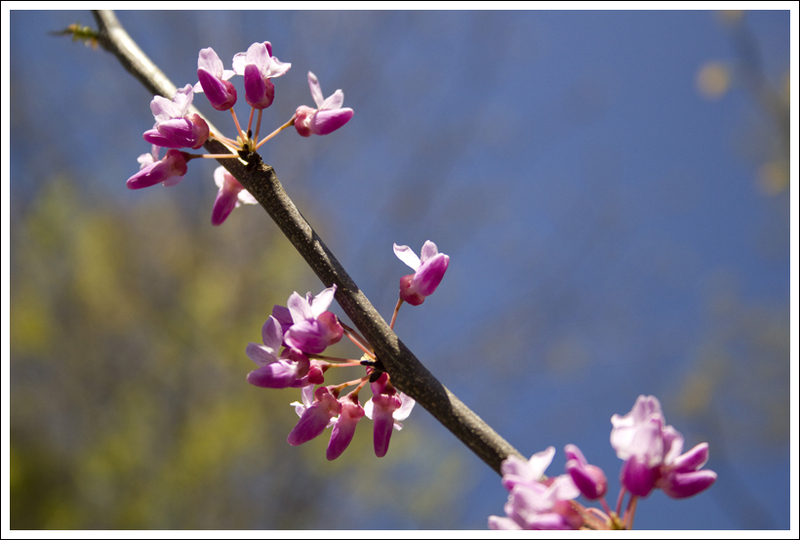 Take a left on the purple-blazed Fridley Gap trail, which follow another wide fire road. You will likely see lots of burned trees from a fire in 2010 that covered a big portion of this area. At 4.5 miles, you will reach another junction. 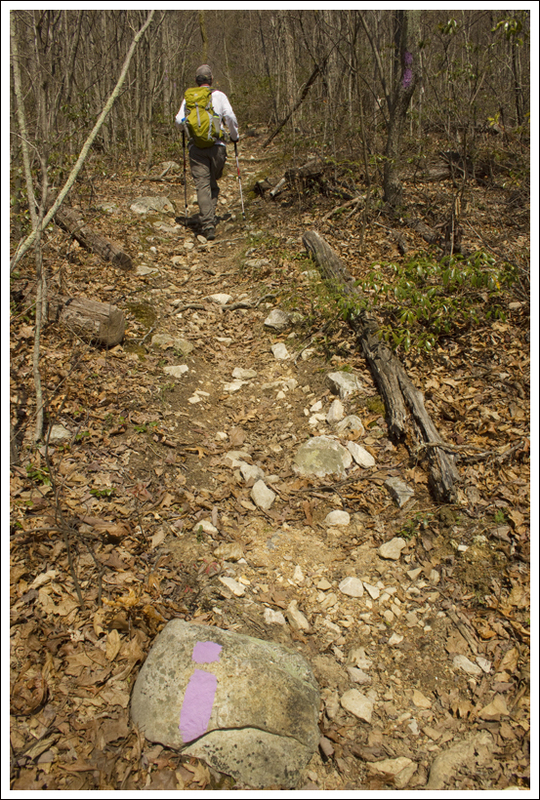 The purple-blazed Fridley Gap trail ascends to the left and continues through the woods. Take this trail and begin a steep ascent across some switchbacks. At 4.85 miles, you will reach the top of your climb and there are a few stones that you can rest on for a few minutes if you need to catch your breath. 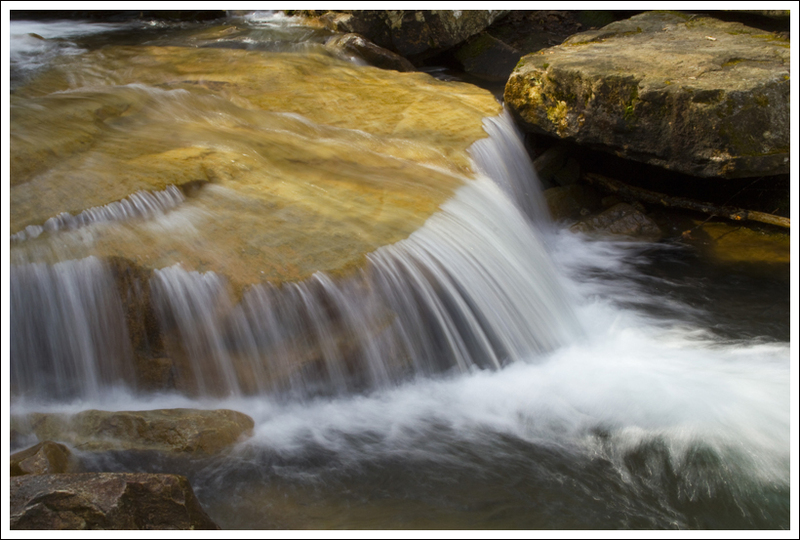 This small waterfall feeds one of the most popular swimming holes in the area. Below: More pretty cascades. The trail now begins to descend very steeply. We were so glad we had our trekking poles since the rocks under the leaves were often loose and it helped to lower ourselves down the steep steps. We were also glad we did this hike this direction rather than the clockwise version of the loop. 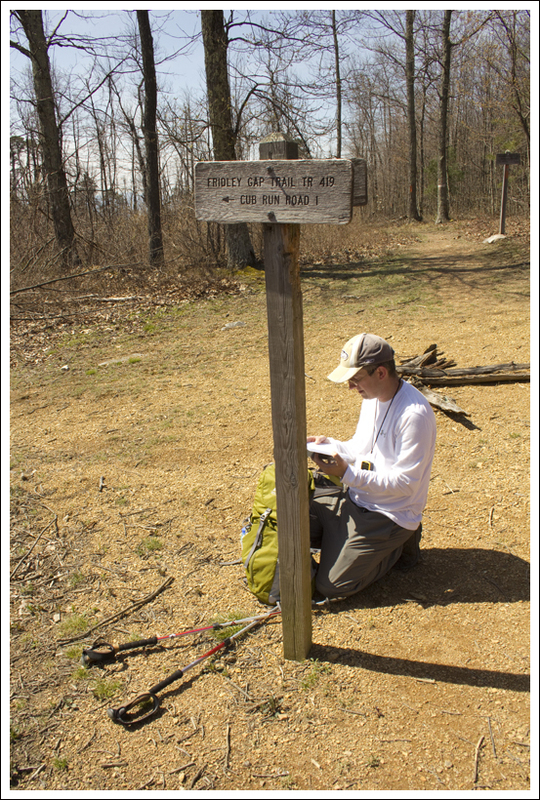 At 5.5 miles, we reached another junction with the Massanutten South trail. Take a left on the orange and purple-blazed fire road (don’t go the way that crosses the bridge) and you will reach the junction that closes the loop at 5.65 miles. Take a right here, crossing Mountain Run again and make your way back down the fire road. 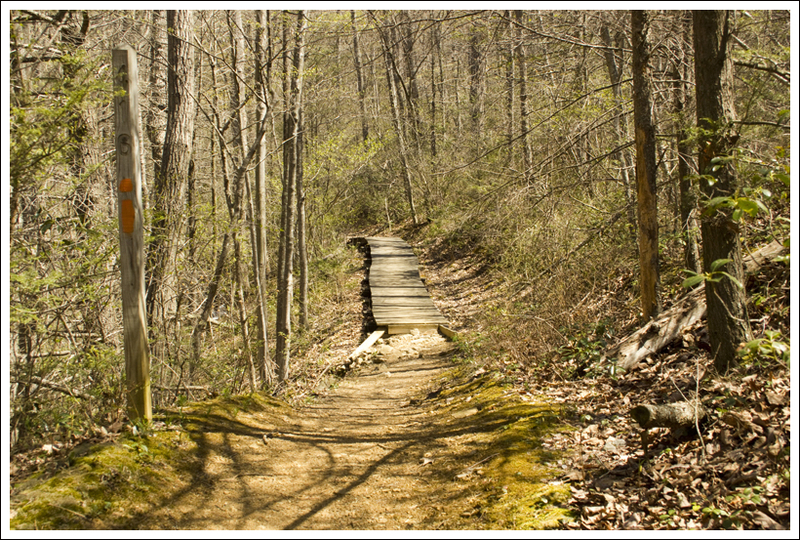 Be sure to catch the rocky path at 5.8 miles that leads back to the parking lot at 6 miles. There is one geocache along the trail, Fridley’s Cache, a normal-sized cache near the swimming hole. It is always a good feeling to know that we redeemed ourselves by covering a hike that we had previously failed to navigate. 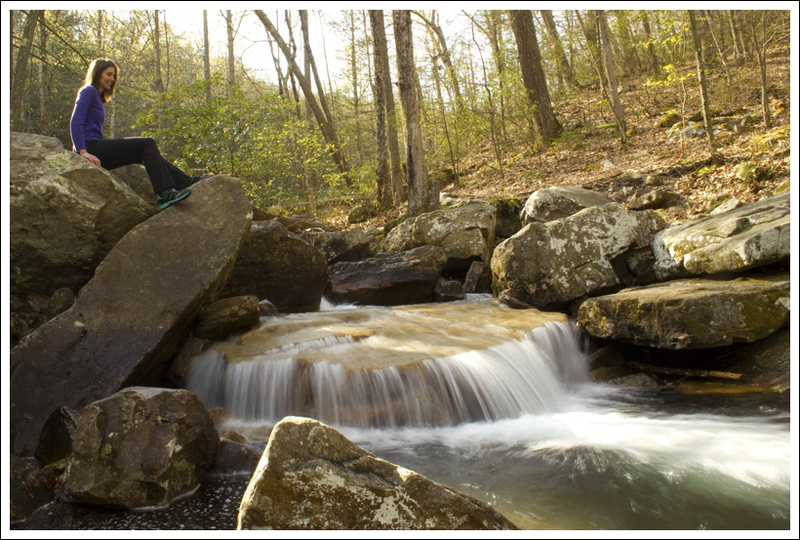 If you are looking for good views of streams or a swimming hole, along with a challenging hike to get some views, this may be a great hike to try out some time. The rocks at Grubbs Overlook might trick people into thinking there isn’t an open view. 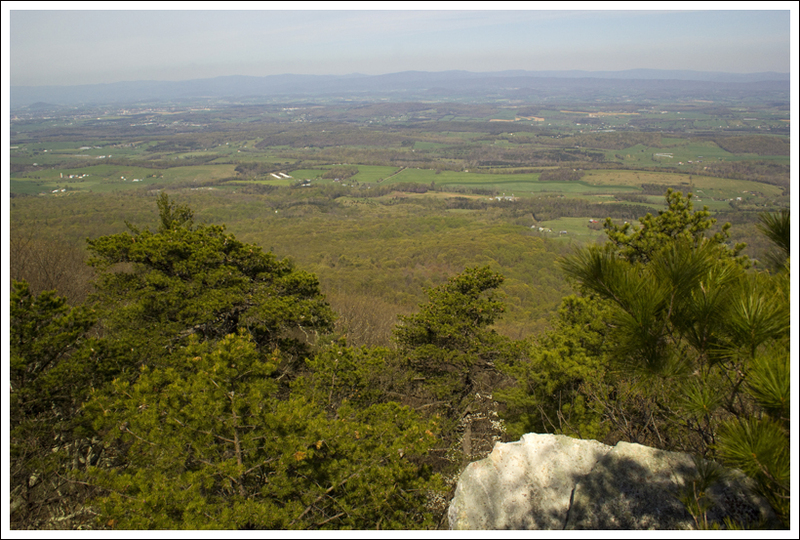 Below: Views from Grubbs Overlook and the campsite that sits adjacent to the overlook. Hallelujah for freshly painted blazes! 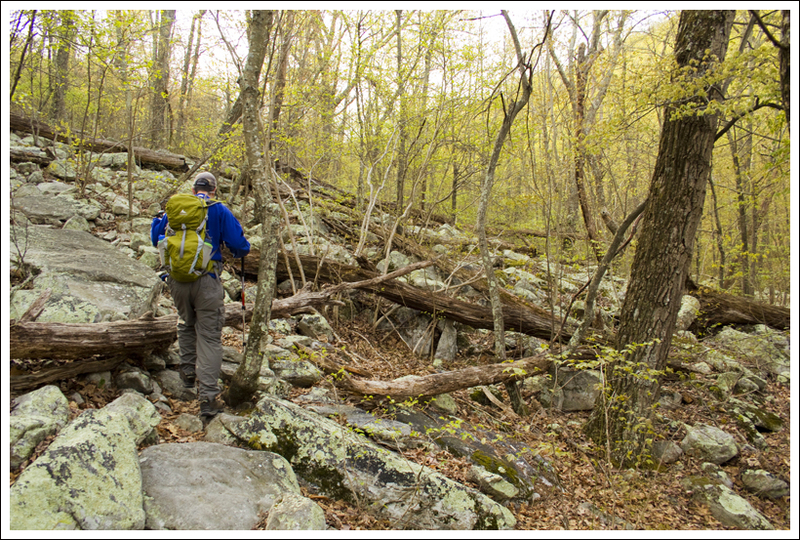 I was so frustrated last year when our attempt to hike the Fridley Gap Loop ended in failure. The failure was mostly my fault. I tried to map out the hike based on a course I saw on someone’s Runkeeper page. There were no directions, just the route overlaid on a rudimentary map of the area. I thought we’d be able to figure things out on our own with a NatGeo map of the area. It turns out that faded blazes and a large group of people camping in the middle of the trail are insurmountable challenges to my ability to navigate. 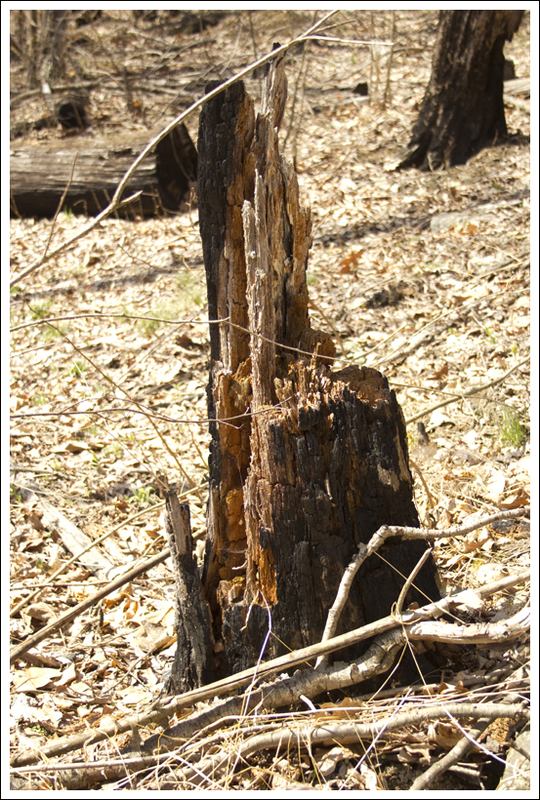 We’ll let bygones be bygones and get on to the successful version of our Fridley Gap hike. Let me start by saying, I loved this hike! It was even better than I expected. The stream was running beautifully, the views of the valley ‘greening up’ below were lovely and the weather was perfect (sunny, cool and breezy enough to keep the bugs away). 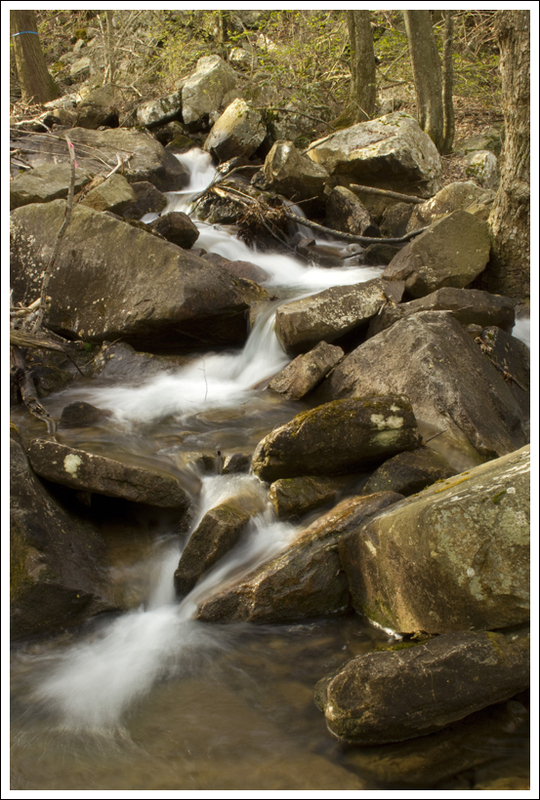 I really enjoyed the little rock-hop as the trail followed the stream bed. The small waterfall and swimming hole were so pretty. The climb up the Massanutten South trail to Grubbs Knob was steep enough to be challenging, but not so steep that we had to stop for a breather. On the way up, we could see all the little signs of spring creeping back into the forest – tiny buds on trees, tightly curled ferns and the occasional early season wildflower poking up through the leaves. The overlook at Grubbs Knob is rather easy to miss. It lies at the top of a faint footpath above a campsite. When you first climb to the top of the footpath, vertical, spine-like plates of rock obstruct any possibility for a view. But if you climb along the rocks, eventually you come to a few footholds that allow you to scramble to the top of the rocks. Once you’re there, the valley below spreads out as far as the eye can see – farms dotted with red barns; small country towns; and wide, green fields make up most of the vista. The climb downhill after Grubbs Knob takes you through dense mountain laurel. The harsh light makes for an ugly photo… but you get the idea. Below: Adam approaches the stream; Crossing Fridley Run. After leaving the Grubbs Overlook, we ascended a few more moments before taking a sharp downhill turn. 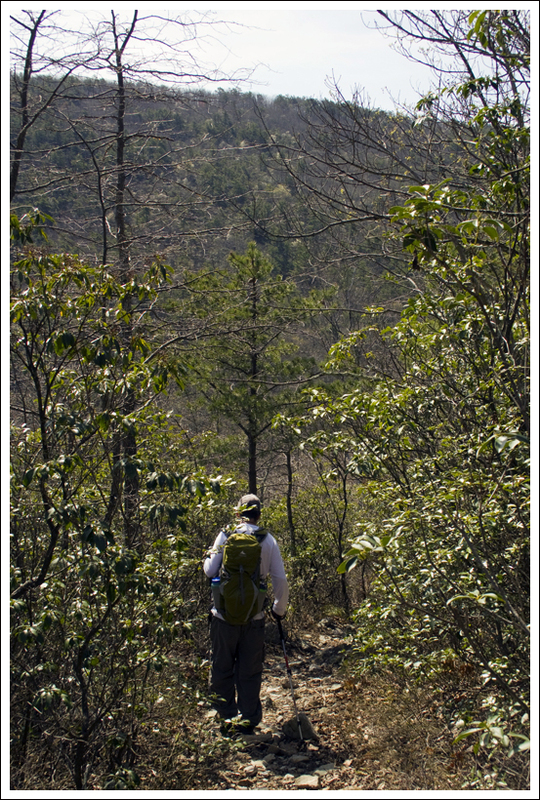 The trail passed through dense mountain laurel, with occasional peeks toward the next ridgeline. Eventually, we heard the sound of water again. For a short way, the trail followed Fridley Run. But soon, we had to cross the stream and head back uphill along a wide fire road. From the fire road, we caught our second open viewpoint of the hike. It was a nice view, but nowhere nearly as lovely as the one from Grubbs Overlook. It’s one thing to slog uphill and come to a magnificent rocky outcropping with a sweeping vista to appreciate. It’s a little less stirring to stop along a roadside and take in a view of a couple mountain ridges. Eventually, the fire road met up at a four-way trail junction. One direction headed toward the Boones Run shelter, another toward Cub Run Road, another continued along the Fridley Gap trail in the direction of Martins Bottom, and of course the fourth headed back in the direction from which we arrived. Seeing this junction made me think of all the different ways these trails cross and connect. There are definitely multiple possibilities for overnight backpacking loops in this area. 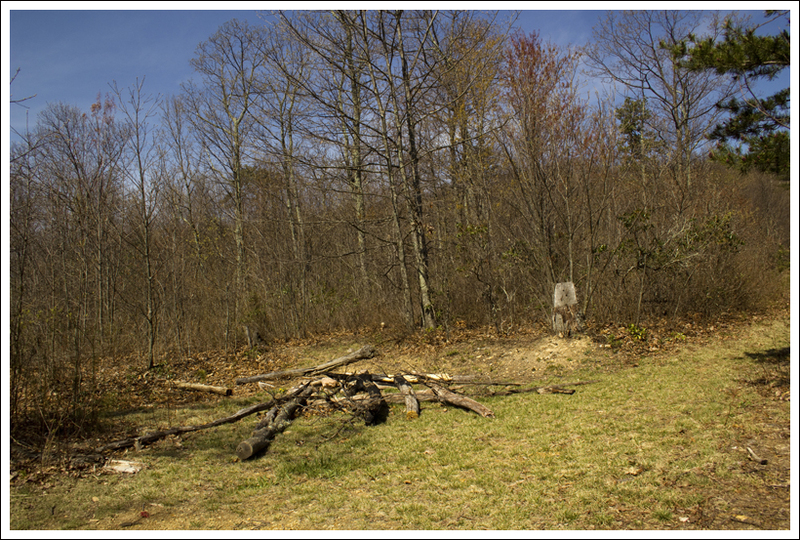 The second overlooks comes at a spot along the fire road. Below: Adam checks out the map at this four-way trail junction; Continuing along the fire road before our climb up Third Mountain; Charred trees from the 2010 fire. We followed the fire road to another junction. Heading straight would have taken us toward Martins Bottom, but to stay on course we turned left and started very steeply uphill along the purple-blazed Fridley Gap trail. By this point of the hike, I was pretty hungry and my energy was starting to flag. If I were smarter, I would have eaten a snack before tackling the climb. But I’m not smart, so I spent most of the climb complaining that I was hungry! After a short break (and snack) atop the tree-covered peak of Third Mountain, we began a crazy-steep descent. For three-quarters of a mile, we carefully picked our way down the craggy, leaf covered mountainside. Through the trees, we could see some really fascinating rock formations on the shoulder of the next mountain over. I kept trying to appreciate the view, but every time I did, I lost my footing a bit. This climb down definitely makes the case for paying attention and using your trekking poles. The ascent of Third Mountain may not look steep in this photo, but it is! 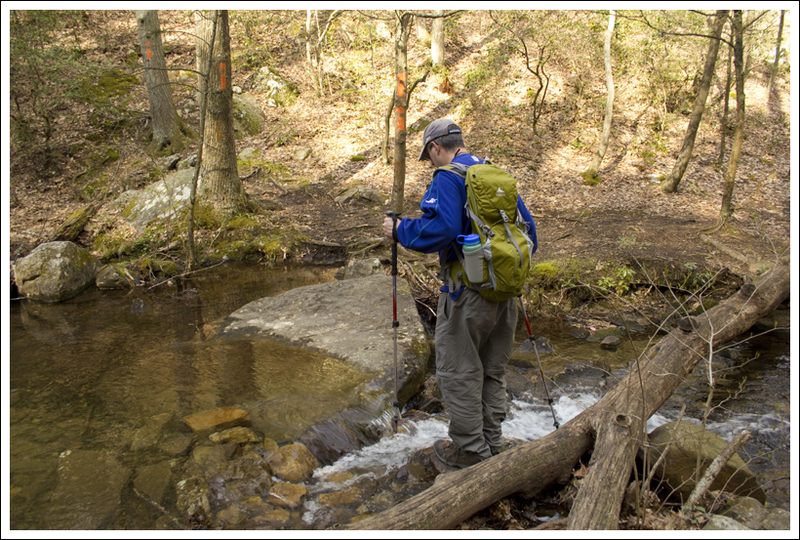 Below: Descending Third Mountain – you can see rock formations through the trees; A bridge not taken on the Massanutten trail; Adam once again crosses the stream we crossed early in our hike. 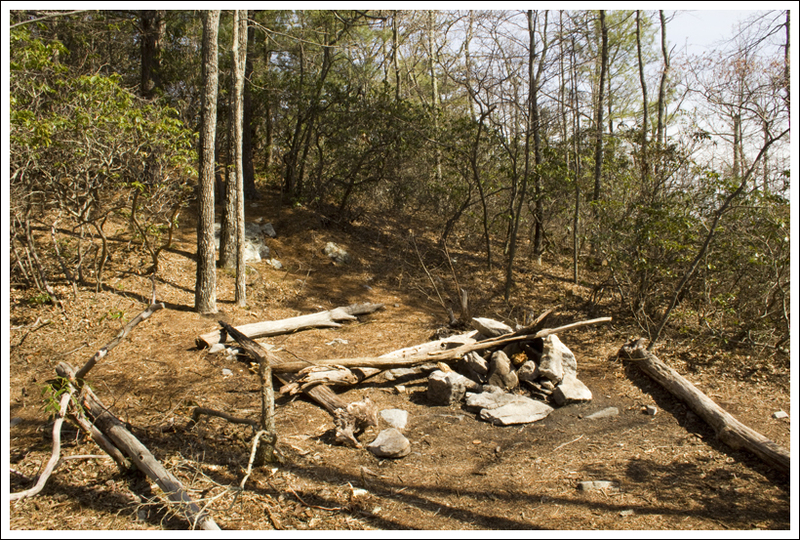 At the bottom of Third Mountain, we had just a short walk back to our original junction – the one where everything went wrong when we tried to hike Fridley Gap last year! I was quite pleased to see that marker again and be 100% certain that we had actually found our way successfully this time around. From the last junction, we retraced our steps through the streambed, past the rockslide and back to our car. Difficulty – 3.5. The trail goes up and down several times. Trail Conditions – 3. The trail had blowdowns, loose conditions, and narrowness, but there were also sections that followed a fireroad. It gets an overall average rating. Views – 3. 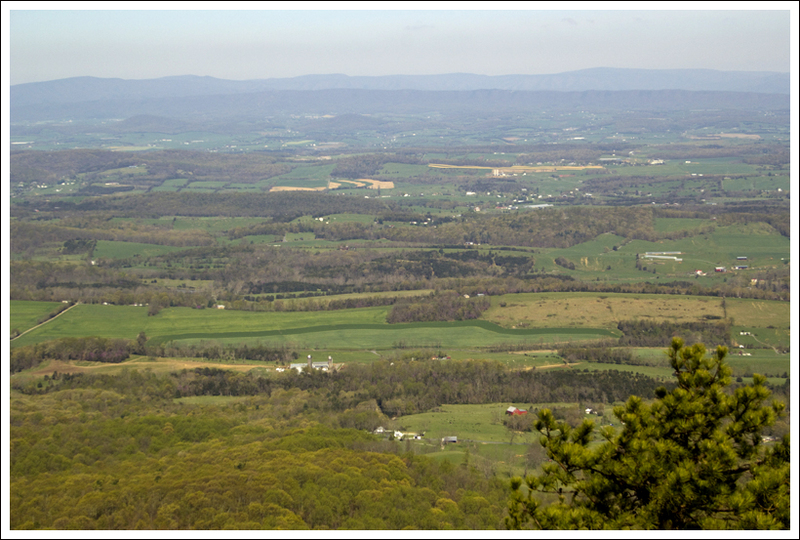 The views from the Grubbs Knob overlook are the best on the trail, but if you miss the path from the campsite you’ll miss the best view on the loop. The views along the path at 3.25 miles are nice, but not remarkable. Waterfalls/streams – 4. The trail goes along (and through) Mountain Run and Fridley Run on several occasions. The small falls and swimming hole gives it a bonus. Wildlife – 2. This may be a good hike for bird watching. We saw a peregrine falcon soaring above at the Grubbs Knob overlook and enjoyed hearing the song of the eastern towhee along the way. Ease to Navigate – 2. If we got lost before, we have to give this a low rating. The path to start the trail from the parking lot could be better blazed and there are several turns to make. Solitude – 4. You may see some people at the swimming hole or camping alongside the junction with Mountain Run and Fridley Run. However, we only saw one other group after this point on a nice spring weekend day. From Harrisonburg, VA, head east on 33. Take a left onto VA-620 North/Indian trail Road and continue for 1.7 miles. The road will turn into Rt. 717. Go 3.4 miles and take a right on Minie Ball Ln. Go 1.1 miles. At this point, the road will turn back into Rt. 620. Go 2.7 miles and take a right, continuing on 620 for about half a mile. Take a right onto Armentrout Path. Take the first left onto Airey Ln. Parking is a lot at the end of this gravel lane. If you pass the lot, you are on private property. The directions to this trailhead are a little confusing, and we recommend putting the coordinates on the map below into your phone/GPS. Very confusing trail after a while, we did the counterclockwise trail and ended up running out of markings as we ended up on Cub Run Road with the last of the markings right there!! Daylight was coming to a close. Thank God, a truck came along and gave us a ride to route 602 and family came and picked us up!! Yes… it can be a confusing loop with the overgrowth and sporadic blazes. We got lost the first time we tried it, too. If you ended up on Cub Run Rd, you just missed the one turn along the fire road where the orange blazes and purple blazes meet. Did you see this sign post? (https://virginiatrails.files.wordpress.com/2013/04/checking-the-map-at-the-junction.jpg) If so, I’m guessing you followed the directional arrow toward the road. The loop described here would have taken you to the left, continuing down the fire road. From there, you would have taken another left and gone steeply uphill, downhill, and then back to your start point.